You think you have it under control. Everything's moving along just fine. But, when you're dealing with a chronic disease, you're really at the mercy of your body. I've been reminded by several friends that I have not posted anything in over a month. I have started a half dozen posts but something would come up, I'd get side tracked, and the post would languish, only to be deleted because I didn't like how it sounded. I was busy at work at the end of July and the first part of August. It's only recently that things have slowed down. I've taken exactly 2 phone calls today. We kind of don't mind because things ratchet up here in a couple of weeks. Once I got caught up, I realized it was the first time since February that I didn't have a pile of things to my left. My daily work gets done and we have even been dismissed early because we were all sitting around surfing the web. Again, this is temporary, but it's a lull we'll take because we know what's coming. I had a doctor's visit in mid-August. It was the required visit to see how my RA is doing. It's been a summer of aches. I realized, as I sat talking to Dr. Francis, that there probably hadn't been more than a couple of handfuls of days since I fell May 1st, where I wasn't in some kind of pain. Now, I use the word "pain" because that's the clinical definition. For me, it's been more of an ache here or there. My left wrist hurts. The next day, it's my right shoulder. The next day it's the middle finger of my right hand. (When fingers hurt, it's always THAT finger. "So, tell me where it hurts." Really? You really want me to tell you?) It's sometimes the same place two days in a row, but not usually. And it's not a stabbing pain. It's an ache. Most of the time, it's easy to ignore. Oh I know it's there, but it doesn't impact my ability to get my work done. It does, however, affect my quality of life. I found, when reliving the summer of 2014, that I had slowed down. I no longer walk. I don't always have pain in my feet or hips, but I lack any sort of energy to put on the shoes when I come home and go for my 6 block walk. I sit which turns into a nap which means I can't fall asleep until 1 and then I'm wide awake between 2-3. 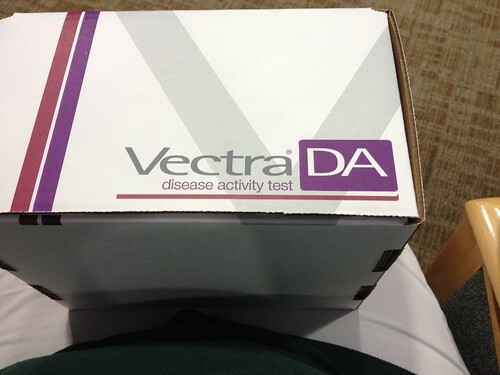 Dr. Francis listened to all of this and asked, "Have I ordered a Vectra scan for you? Hmmmm, I have not. We need that." You can see on the box that it's a test for disease activity. It's used to find out how much of an auto-immune disease is in a patient's blood. It rates markers on a 1-100 scale. The test takes a week. I was told I'd get a call, but I never did, which is fine. Dr. Francis got the results in less than a week. My RA marker is 52. That puts me at the low end of "moderate". While I don't feel horrible, the daily ache and the fatigue are also marks of moving up, as it were, into the moderate category, from "mild" RA. I won't lie and say I have dealt with this wonderfully. I was, and to a degree, still am, depressed by this finding. I tried to tell myself, when the blood was drawn, that it would be a low number and I was doing fine. But my heart was telling me something else. I was not surprised at the higher number, sad, but not surprised. So, what is the next step? My vitamin D level was low, too, so I have added 5,000 unit pills daily. I could also spend 15 minutes every day that it's sunny, sitting in the sunshine to up my levels. I don't go home and sit on the deck after work. I usually have energy at that point so I use it to try to get things done before I feel drained. Prednisone was added back in to help control the inflammation of and ease the aches in my joints. I had prednisone left over from March so I'm using that up. I had started with a whole pill and then moved to a half pill before going off. I'm back to a whole pill which is 2 halves. 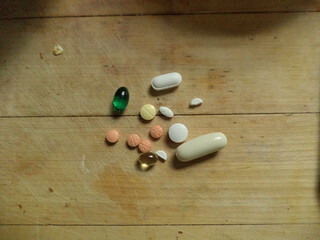 The big thing is the introduction of what's called a "biologic" into my medications. Over a year ago, I was approved for a drug called Orencia, one of a new breed of biologics which were developed only for RA. You may have seen Humira advertised for RA. It can be but it was developed for Crohn's Disease and helping RA is a side benefit. I wasn't interested in that. I wanted an RA specific drug. Orencia is also available only as an injected medication. Either I would have to give myself weekly shots or I'd need to go to the lab once a month and have them do it. Personally, the idea of giving myself a shot scares me so Dr. Francis is going to try to get me approved for Xeljanz, which is the only RA biologic available in pill form. It will be another week before I know the status of that request. What isn't shown above is the sleeping pill I now take. The above batch is the Saturday pills. I take the same amount, minus the green pill, on Sunday. Then green and salmon color pills are removed for the rest of the week. I used to look at these and think, "It's not so bad. I just take the methotrexate. Everything else is a vitamin." But I'm also taking a small white pill, a diuretic, to help heal my leg from falling in May. RA slows the healing process. And the sleeping pill was added because I kept waking up at 2-3 a.m. and taking an hour to fall back asleep. It keeps me asleep all night. My hope is that I'm retraining my body to expect to sleep through the night instead of expecting to be awakened at 2-3 a.m. I don't remember why I was waking up at that hour in the first place which would have caused my body to think it was acceptable to be up. While this helps, RA leaves many sufferers with chronic fatigue that no amount of sleep can dispel. I think that's what depresses me the most. I just can't seem to feel energized by sleep. I sit down to read and am asleep in 10 minutes. Heaven help me if I have to be on my feet working. I come home exhausted and can easily take a 2 hour nap. This influences what I do, when I do it, what I want to do, what I eat, everything. It magnifies the little things that don't need to be magnified. I can't sweep the house because I'm too tired so everything is dirty now. I can't get the kitchen cleaned because I'm too tired, so I see every little thing that needs to be cleaned. I want to sort stuff. I'm too tired to do it so the piles remain for weeks, for months. I make promises to myself I can't keep, which depresses me. I'm scared for the cost of yet another medication, something rather brand new. Will there be enough or will there not? What about Christmas this year? Carole's birthday? I don't feel like eating so I don't. I eat lunch out way more than I should, which compounds my feeling of financial insecurity. I'm too tired to cook anything that could have leftovers which I could take to work. So I get up late and think, "I'll just get Subway for lunch". I shouldn't be doing that, but, to my only credit, I do make very good food choices when I eat out at lunch. I buy food I like so that I will take lunch but assembling it in the morning can be an exercise in futility when I'm stiff and I got up late. I'm not posting to ask for pity. Oh heavens, that's the last thing I want. I have no use for that emotion. I'm explaining where I'm at in my life right now. I'm trying to remember gratitude. I do get up easier now than I have in years. I'm not as stiff as I used to be. But the gradual fatigue, over the course of the day, wears me out. The minor daily ache of one body part wears me out. I tell myself to keep moving but the reality is that I don't. I'm not sure, right now, what makes me happy, other than the girls. So, I apologize for not being here, for not posting. I tried, but it has felt as if the world has closed in this summer. We are approaching my favorite season and with Iowa football and hot cider and pumpkins and apples and crisp fall days can come a resurgence of energy. I will continue to keep on keeping on. I hope that over the next while you will feel a bit better. I cannot imagine what it is like to have RA. Hug your girls, Maybe pet therapy can help a bit.